What’s the Perfect Gift for Anyone you Care about? If you’re anything like me you struggle to find fresh ideas for gifts for the people in your life that matter most. You’ll know how easy it is to opt for the predictable choices such as flowers, chocolates, and perfume/aftershave, and if you’re a dad, socks seems a favourite. While all these gifts have their merits, they don’t exactly shout originality. So what combines the best aspects of gifts like flowers, with gifts like going for a meal at a fancy restaurant? Well let’s first look at the type of gifts available and the benefit they offer. Flowers are for sure a classic gift choice for mums, daughters, sisters, and partners, less so for the men in our lives. They bring beauty to our homes in the form of visual and smell stimulation, but only for a few days or a week, if we’re lucky, then they’re gone. Plants are a more long term solution if you’re looking to extend the shelf life of your gift. A typical bunch of flowers can set you back £30 – £40, plants are usually in the £10-£30 range. Chocolates are another option open to you, but if you’re looking to spend a decent amount on close loved ones, then you’d have to buy a lot of chocolates for even a modest amount like £30, and most of us wouldn’t welcome having to eat through £30 worth of chocolate would we? Chocolates are a consumable gift so by their very nature aren’t a long term solution. If we want to buy a gift that the recipient can keep for years to come, jewellery, or electronic items like phones, game consoles, TV’s and the like come to mind. But these will usually set you back a few hundred pounds at the very least. Now another increasingly popular option is not to buy physical products like we have mentioned above, but instead opt for experience based gifts. Experience gifts are all about doing the things we might not do or have not done before but we fancy trying out. They are outside our normal daily routine. Experiences vary from adrenaline fuelled pursuits like hot air ballooning and race days to more sedate pursuits like pamper experiences. So which is best? Do you go for the product based gifts, and if so, consumable or keepsakes? People have so many possessions these days do they really need more stuff? If not then how about experience based gifts? Would they rather crank up the heart rate and jump out of a plane or pretend to be the next Nigel Mansell or would they prefer to have a more relaxing time at a spar? Well how about combining the benefits of an experience with those of a product based gift, and not just a generic product but a personalised one? Well I am delighted to be able to offer you such a prize. Our Photoshoots Gift Experiences are just what you’re looking for. A fun experience: having a professional photoshoot in a purpose build studio and a print keepsake from the session to keep for a lifetime memento of that personal experience.These shoots are great for the family to enjoy, for the kids, even for the pets in your life. Our Makeover photoshoots are even better with a professional hair and make-up styling session prior to the shoot, which is an experience in itself, and again you get to keep an image as a keepsake, all included in the gift. These experiences start at the special price of £49, which in the context of the other possible gifts options discussed above. is a bargain in our opinion and in the opinion of so many of our clients. Check the range of photoshoot gifts here. They are available as gift vouchers so you can give the recipient the voucher on their birthday or whatever occasion you’re buying it for, and they can book at their own convenience, and with no expiry dates on vouchers, they don’t have to rush to get it booked in either. Please share this video with friends and family by clicking on the share button to the left of here, and many thanks for sharing. 🙂 After doing so check out more information regarding our makeover photoshoots. Celebrate Halloween and come to Mike Turner Photography and enjoy a one of our Halloween photo shoot experiences in Lowton, Warrington, or if you can’t find the time to fit it in before Xmas, why not buy one of our Gift Vouchers, and enjoy it anytime in the coming year. These photo shoot Gift Vouchers are also ideal to buy for family and friends as a Halloween gift. If you’re thinking of buying a photo shoot for yourself, then Halloween is the perfect time to have it done, and have something to display on your walls in time for the upcoming Xmas festivities. We can provide unique wall art, framed, on canvas, acrylics the options are endless. We also provide digital file options. Halloween photo shoots can be for your family, children, babies, and even pets, or a combination of all of these. We recommend you get in touch with us, and discuss your requirements, we will be more than happy to advise you on the best solution for your needs, with no obligations on your part, we’re here to help. 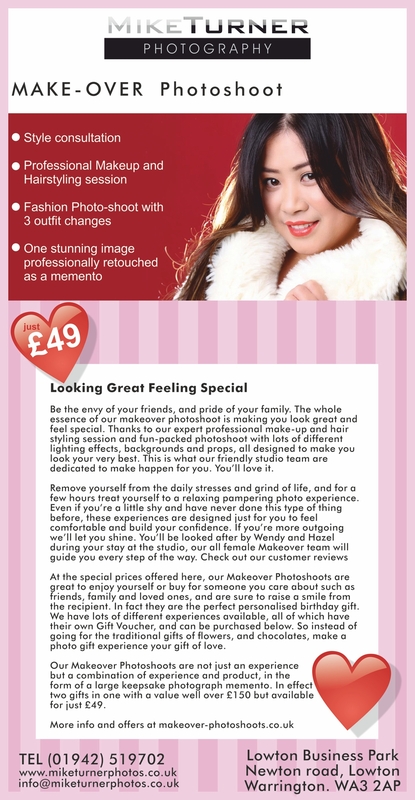 Check out our latest photoshoot offers on our special offers page. The angry ghost of Joshua Rigby, a Lowton farmer is said to be seen running down the quiet Sandy lane on dark nights. Mr Rigby was known to be a cruel man particularly to his elderly sisters. He would often boast about his wealth in local public houses and taunt his nephews that they would not get their hands on it after this death. He was persuaded by his nephew John Gibbons to make a will in case he go to prison for cruelty after being caught beating his sister with a belt. In the June of 1883 he signed his will, leaving everything he owned to John, just a few weeks later Joshua with found with his throat cut in this bedroom, on further investigation John Gibbon was found in possession of this will and bank book. He was arrested and an inquest was held at the Jolly Carter Inn, at the top of Sandy lane. John Gibbons was committed to Liverpool Crown Court on suspition of murder, after two doctors gave evidence that a blow from his heavy boots could have caused Joshua’s head injuries and a long grey hair was found in the seam of the accused’s boot. However the trial feel apart and John returned to Lowton after serving two months in prison. The gruseome goings on remained the main topic of conversation and speculation for months and were covered by the local press. For years after that, however, many people reported sightings of the old man’s ghost stalking the lanes and fields around the farm – it is often seen by the late night customers of the Jolly Carter Inn. Sources “Ghosts of Leigh” by Cyril Ward and Memories of Lowton by Richard Ridyard.